The fifth phase Government of the United Republic of Tanzania has demonstrated renewed commitment to industrialization, as part of a broader agenda to create employment opportunities and substantially reduce poverty. This renewed commitment to promoting industrial development is timely. Literature suggests that economic development requires structural change from low to high-productivity activities, and that the industrial sector is a key engine of growth in the development process. Virtually all country cases of high, rapid and sustained economic growth have been associated with industrialization, particularly growth in manufacturing production. Unfortunatley, the manufacturing sector in Tanzania is an example of disappointing sectoral performance. In the past, policy failures both in design and implementation have contributed to poor industrial performance. During the import-substitution phase of the 1970s, government policies and efforts focused more on providing support to domestic firms than on getting them to perform. Furthermore, the emphasis was on setting up industries rather than on building dynamic capabilities that would allow firms to be competitive. High protection meant that domestic firms were poorly prepared for international competition. The fact that the state created and operated the manufacturing firms simply made the problem worse. Investments were often made with little regard to efficiency, and the managerial capacity of the state was badly overstretched. The structural adjustment phase of the 1980s and 1990s, saw the withdrawal of government support, even in the presence of market failures, and the liberalization of trade without taking account of the capabilities of domestic firms is another example of policy failure. Emerging from being the worst affected during the economic crises of the early 1980s, (despite massive public investments), the sector has never really recovered. The main reforms in the sector evolved around restructuring activities and liberalizing the investment climate. While there were mild achievements in a few industries, the rest were either stagnant or worse off. With the ushering of the Poverty Reduction Strategy Papers (PRSPs) in the early 2000s, resources were shifted away from the productive sectors that are necessary for sustained growth and poverty reduction, with a new focus on the social sectors. Although policy failures did contribute to poor industrial performance, structural factors also played a role. The structural factors are manifest in the form of poor infrastructure (including roads, airways, railways, and communication), low human capital, small size of domestic markets, and a low entrepreneurial base. No industry can run smoothly in an environment where the whole range of basic infrastructure leaves a lot to be desired. Fortunately, we are now seeing efforts by the Government to address infrastructural constraints, but these efforts need to be intensified. The small size of domestic markets in Tanzania implies that we are unlikely to sustain an industrialization agenda without access to regional and global markets. These external markets would provide an opportunity to expand production as well as exports, and reap the benefits of scale economies. It would also make available the much needed foreign exchange to import intermediate inputs and capital goods for domestic industries. But are we competitive enough to enter into these markets? It is important that industrial development efforts be part of an overall process of integration into the global economy rather than inward-looking as was the case during the import-substitution phase. Imposing import bans on goods will only help firms targeting the domestic market, and in a way be a “cost” to consumers who would have otherwise accessed cheaper imports of the same or even higher quality. There should be efforts towards building the capabilities of domestic firms and preparing them to compete in export markets for medium and high-technology manufactured goods. While the Goverment has recognized the necessity to promote industrial and manufacturing development in order to address the country’s development challenges, there is need to search for an approach that is strategic, integrates lessons from the past, and takes into account the realities of a changing global environment. Investment in human capital should be key to any such strategy so as to improve efficiency and thus productivity levels. This, however, must be supported by necessary public goods (particularly investments in infrastructure), support institutions (for trade facilitation, credit, access to technology, establishment of standards and certification) and an incentive structure that is conducive to industrial growth. So, in the fierce competition of export markets, does Tanzania stand a chance? Yes, it does. Not that it will be easy or quick, but with better policies and more investment, we could be competitive in things like agro-products, footwear, furniture and other low-skill industries. Opportunities are there, but we need to strategize and implement plans. Otherwise we may remain stuck in only exporting natural resources. Is there a right formula for managing the oil and gas sector in Tanzania? Discussion and debates around natural resources in Tanzania have in recent years focused on the projected revenues from the gas sector. The new discoveries of natural gas have shifted the nation’s conversation to turn to look at what this gas can do for the country. The underlying assumption here is that if the gas is developed, processed, piped and exported, it will bring in significant cash flow to the government; a new cash cow of sort. This is all well and good – in theory. In practice, the process is not all that simple and if not managed ‘right’, then we may not realise the projected revenues that are meant to come from the gas reserves. How then do we properly manage the sector? What should we put in place? What should we do first? What should we NOT do? These are all important questions that we should be asking ourselves and thinking critically as to how to position ourselves to truly benefit from our natural resources. They cannot all be answered at one go, nor should they be attempted to be answered at one go as this is a complex sector that needs careful analysis. What we should do is learn from others that have gone before us on this journey, and determine which lessons we can take forward and which we should leave behind. Not all will work for us as Tanzania, but there may be some experiences that we can take from and build on – some good foundations. An example of this is from a recent trip to Ghana, which revealed that their natural resources are protected in the mother law – the Constitution – with powers vested in the parliament to look at each and every contract that is in the realm of natural resources prior to approval. This oversight role is important in ensuring that each contract attains maximum benefit for citizens. This is indeed an important lesson for us in Tanzania, where does the buck stop with us? Ingredient 1: Have in place a comprehensive national strategy or ‘vision’ for the sector with an effective coordination framework; this means developing a shared blueprint (vision) and creating an “authorizing environment” for the natural gas sector which spans all the relevant ministries and is housed at a high office. Ingredient 2: Ensure Government ownership of geological information so that the Government knows how much is available and where, this will provide ownership of the data to the Government. Ingredient 3: Empower citizens with correct information which speaks to the need to have a critical mass of informed citizens which can hold the Government accountable. Ingredient 4: Secure efficient allocation of licenses to ensure maximum benefits by having a transparent licensing regime. Ingredient 5: Realise the full value from the natural resources by vesting ownership to the Government through empowering the National Oil Company as a commercial entity, as well as ensuring that tax regimes enable the government to realize the value of resources. Ingredient 6: Put in place an effective regulatory framework by establishing a regulatory authority and frameworks for upstream, as well as effective institutions and frameworks for midstream and downstream. Ingredient 7: Make sure environmental and social costs of oil & gas projects are accounted for, mitigated and offset, which will mean enhancing monitoring of company operations, enforcement of compliance to laws that safeguard surrounding communities from harmful environmental impacts, as well as putting in place an effective system to respond to environmental disasters (such as oil spills or hazardous leaks). Ingredient 8: Invest oil & gas revenues to achieve optimal and equitable outcomes for both current and future generations. Here we could learn from others and establish a Gas Revenue Fund which is independent, with the purpose of ring-fencing funding for continuous development of the oil & gas industry, ensuring financing of strategic infrastructure, managing fiscal volatility as well as saving for the future generations. Ingredient 9: Design integration of the oil and gas sector for economic transformation, by harnessing oil and gas to transform other critical sectors such as infrastructure as well as ensuring local content (employment, local supply chain,s etc.) and local skills are developed. Ingredient 10: Dialogue with International Oil Companies (IOCs), to ensure they are committed to contributing to sustainable development through their Corporate Social Responsibility (CSR) in line with local development plans, as well as adhering to national standards. Ingredient 11: Engage the International Community to support the sustainable development efforts of the country, by encouraging IOCs to operate in the same way as they operate in their countries of origin. Information sharing initiatives should be enhanced, while ensuring that the host country proactively engages with the IOCs. This does not suggest that these ingredients are a magic pill; nor that they will guarantee ‘getting it right’, but it is a start. There is no one ‘right’ formula – no one size fits all in managing the sector, however, there are ingredients which are essential, and looking at what other countries have done, which give us a starting point, may put us on a path that could potentially work for Tanzania. Vice-President Hon. Samia Suluhu Hassan gives the key-note address during the Women in Leadership Conference held at Julius Nyerere International Convention Center that gathered 100 women leaders in business, government, the private sector, civil society and politics on 12th April 2016. Vice-President H.E Samia Suluhu Hassan gives the key-note address during the Women in Leadership Conference held at Julius Nyerere International Convention Center that gathered 100 women leaders in business, government, the private sector, civil society and politics on 12th April, 2016. CEO of UONGOZI Institute, Prof. Joseph Semboja gives his welcoming remarks on behalf of the Institute. Researcher at UONGOZI Institute, Caroline Israel presents the findings of the research study on Women in Leadership completed this year. Executive Director of Women Fund Tanzania and co-researcher of the research study on Women in Leadership, Mrs. Mary Rusimbi makes a point during the forum. Former Speaker of the Tanzanian National Assembly, Hon. Anna Makinda shares her experience on being a woman leader in Africa. Participants follow the discussion at the conference. Vice-President Hon. Samia Suluhu Hassan (center) in a group photo with some of the participants. From Left: Veteran politician and panelist at the forum, Hon. Zakhia Meghji; CEO of UONGOZI Institute, Prof. Joseph Semboja; former Speaker of the National Assembly, Hon. Anna Makinda; and District Commissioner of Mtwara, Hon. Fatma Ally. Youth leadership development programmes and networks have become abundant in Africa. Each claiming to equip, support, and inspire ‘the next generation of Africa’s leaders’. Leadership is a great challenge for Africa, and one of the things we can draw from the numerous and massive investments in Africa’s young high-achievers and those recognised as ‘high potential’ is that the world is taking ‘the next generation of Africa’s leaders’ very seriously. History tells us that young people, whether in the civil rights movement of the United States or the ‘Arab Spring’ across North Africa and the Middle East, play a critical role in ushering in change. Indeed, many of the icons of Africa’s independence era were all relatively young when they led us to independence: Kenneth Kaunda (40), Patrice Lumumba (34), Samora Machel (41), Kwame Nkrumah (47), Julius Nyerere (39), Thomas Sankara (33), Haile Selassie I (24), Sekou Toure (36), etc. At the very least, this list of distinguished men (and this is not to detract from the critical role of women in these movements) highlights the potential of youth. It should be noted, none of the above-mentioned (nor other leaders of that generation) ever had opportunities for specialised and dedicated grooming in the form of youth leadership programmes. However, they were visionary in the sense that they quickly realised that they needed each other – the pan-African struggle is and was as much a moral battle as it was a case of ‘enlightened self-interest’ since their fates were intimately linked. Sadly, there are few examples where youth organise themselves or are being organised by, of and for Africa. This reflects a failure to recognise the power and importance of networks of and for leaders (and leadership). In part, this is due to an emphasis on leaders as individuals. Sadly, this is a lesson from the past that we are ignoring. Not organising young high achievers and high- potential youths is a missed opportunity. That the world recognises Africa’s talents and potential is great – and well deserved for the many men and women who have had the privilege and opportunity to participate in these programmes. However, there is a missing piece to the puzzle. In order for Africa to progress as Africa, we need to build the relationships between these young individuals to understand our different pasts and value-systems, and build consensus around our common purpose and destiny, on our terms. We are failing to marshal these (would-be) ‘leaders’ into a cohesive ‘leadership’ that will drive the continent and her people forward. This requires specialised investment in and organisation of this demographic that so far has not been forthcoming by the continent itself. The most valuable component of these programmes is not the technical knowledge that is gained, nor is it the opportunity to practice particular skills associated with ‘leading’. The community (or network) of peers who one can reach out to for guidance or support is by far the most valuable take-away for participants. 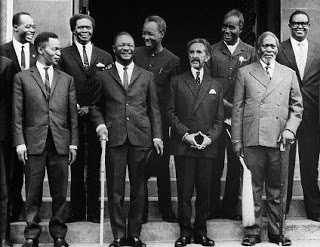 As mentioned above, the liberation-era leaders across Africa formed these social bonds and are known to have been in constant communication. Despite the lack of specialised grooming, they realised the importance of alliances and a group of leaders (peers) to form a collective leadership. These relationships were vital in securing Africa’s independence. Such relationships are, and will be, vital for good leadership in Africa. As these programmes are often not Africa based or formed, which individuals are being promoted, and why? How are potential-leaders identified? For what purpose are they being groomed? Are we coaching and mentoring would-be leaders to equip them with the skills and knowledge to understand how Africa got to be where it is today, why we face the challenges we face, where Africa’s place is in the world, and what efforts we can build on to get a better seat at the global table? This piece starts with a famous quote from Franz Fanon, a psychiatrist and anti-colonial philosopher who fought in the Algerian War of Independence. It speaks to the heart of the matter regarding the development of young and emerging leaders in Africa – for what? Through the African Union, African Heads of State and Government have adopted the Agenda 2063 (with its seven pillars) followed by seven goals. Are these the tasks we are setting our leaders? Are we doing enough to prepare ourselves across private, public, and civil society spaces to take on the leadership challenges that fulfilling these seven goals will face, and are our leaders doing enough to prepare future leaders for this task? If we are serious about our future, we must groom the young and emerging leaders of today, to move us towards sustainable development and transformation. We must prepare them, so that when they too become Elders, they will in turn help to prepare future young and emerging leaders for Africa. For this, Africa too must look to the talented individuals across the continent and give them the opportunities and support they need to succeed – and we need to get them talking to, and working with, each other.